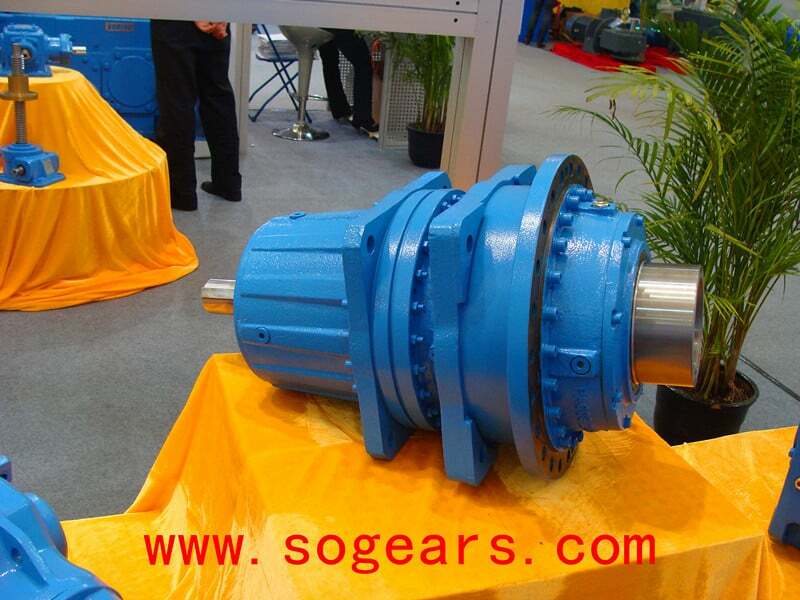 This is the foot mounted planetary gearbox with gray color. In the back, it is connecting with helical geared motor so that the total ratio could be enlarged to 99999. The bigger ratio, the larger torque finally. The shaft could be customized with different size and also for the key way. This is a planetary gear head with yellow color. The flange from the input side could be connected with electric motor such as AC or DC, the hydraulic motor， and even by hand. 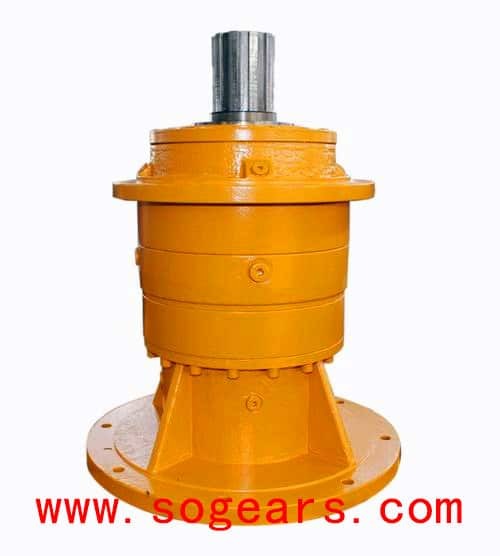 This is a vertical mounting planetary gearbox and the shaft could be up or down which depends the exact usage. This is a standard planetary geared motor which is made by two parts mainly, one is the gearbox and another one is electric motor. 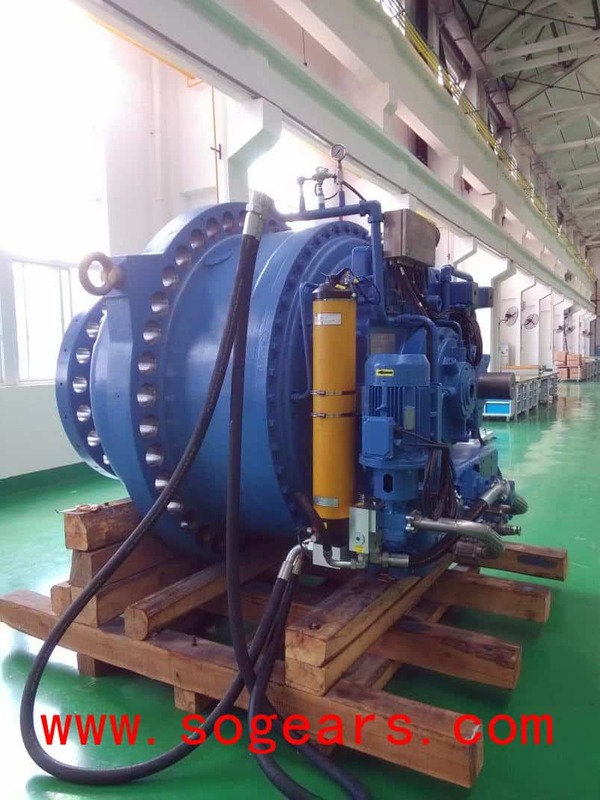 horizontal mounted, with wide range ratio from 1 to 9999 which could meet lot of industry application.The picture is a two stage speed reduction gearbox. also, we have three or four and so on. 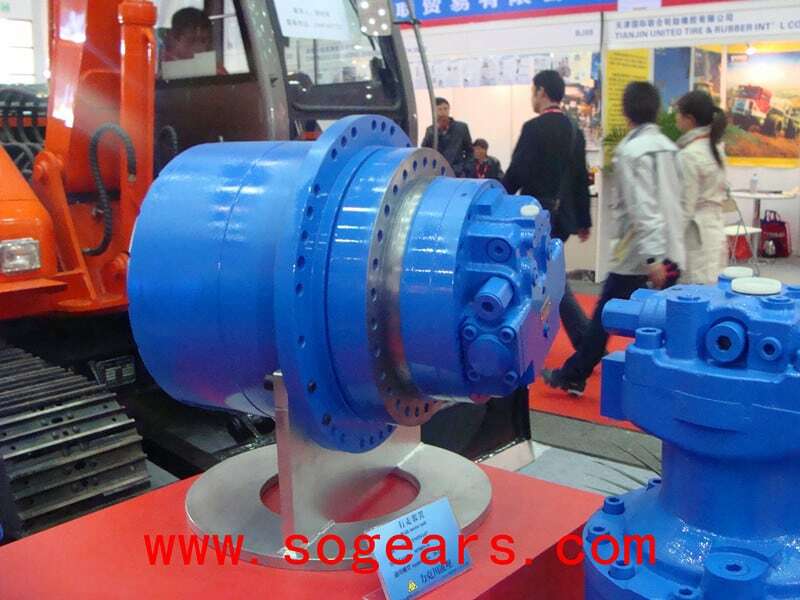 This is our planetary gearbox showed in China Expo and it has earned many sight from this fair. A lot customers come to us to inquiry on this one and they give a big interest. Current, we have exported this model to Asia, South-America, Europe. The output with spline is widely used for mining industry， crane and hoist , marine etc. 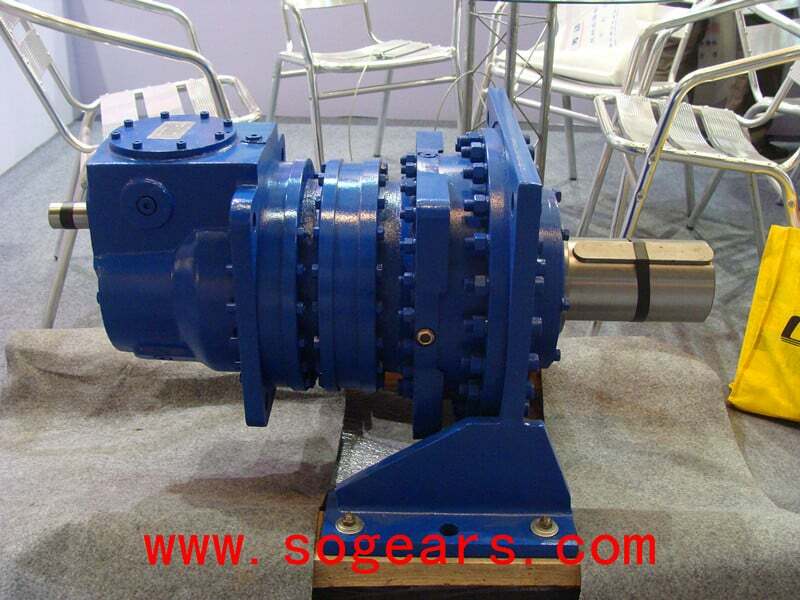 The main transmission structure of the planetary gear reducer is with planetary gear, sun gear and ring gear outside. Due to special structural, the planetary gearbox has a minimum of 3 for single-stage deceleration and a maximum of 10 for maximum. The common reduction ratio is 3.4.5.6.8.10, and the number of reducers is generally not more than 3, but there are some large reduction ratios. 4-level deceleration. Our planetary gearbox in the sample room. The internal gears are 20CvMnT carburized and being grinded. 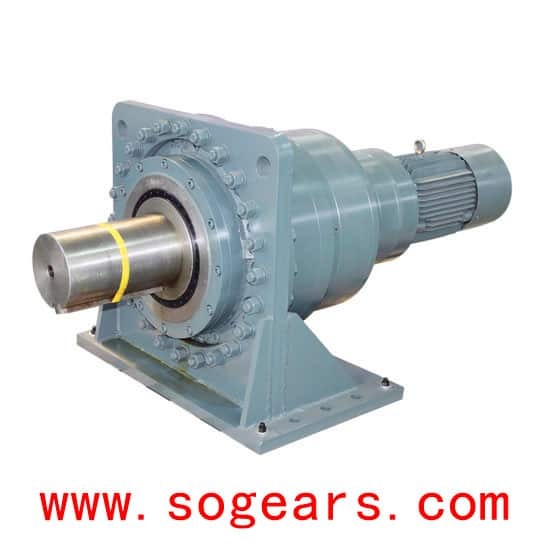 The complete gearbox has the characteristics of small structure size, large output torque, high speed ratio, high efficiency, safe and reliable performance. 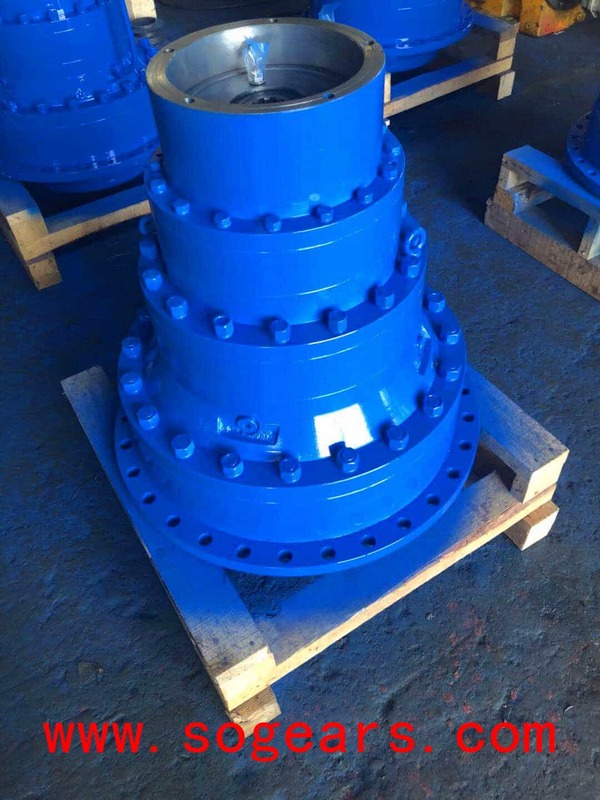 To make a perfect performance on the painting which is to protect the quality of the steel plate inside it, reduce the degree of corrosion, and also to extend the service life, we have imported a advance equipment from German and you can see the painting on our gearbox is different from other suppliers in China. This planetary gearbox is a new type of reducer with both vertical and horizontal installations and a wide range of applications. It is mainly used for pipe jacking machines in municipal engineering, urban construction, environmental protection and traffic engineering. This one has a Large carrying capacity, Mechanical stability, High efficiency and low noise. Cost is higher than others usually. Good distribution system makes the body light and compact. Our gearboxes are with high efficiency and optimal maintenance cycle life which can save a lot of costs for operating. Also, it can be combination with other models of gearbox. 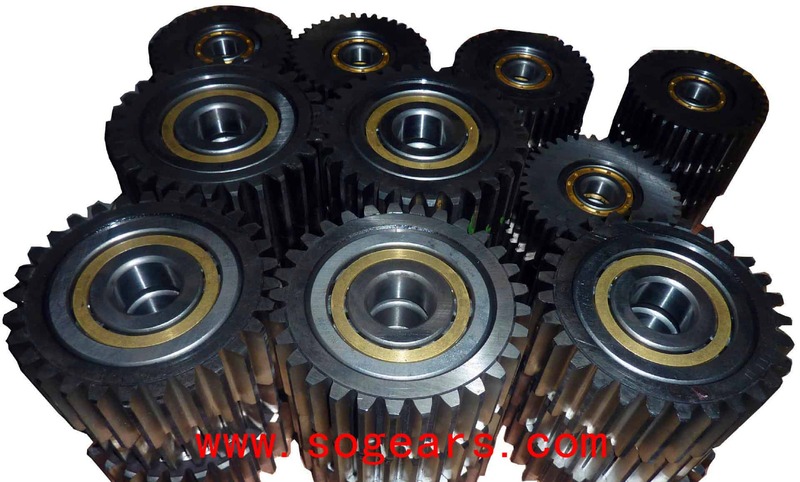 We aimed to make the lowest noise in the gearbox so that the box body is made of ductile iron, which greatly improves the rigidity and shock resistance of the box.In additional, the sun gear, planetary gear, inner ring gear and spiral bevel gear in the box are treated by carburizing and quenching in a controlled atmosphere to obtain a high-hard wear-resistant surface. After heat treatment, all the teeth are ground, which reduces noise and improves the whole machine. Efficiency and service life. This is the gearboxes customized for our Malaysia customer. and it is used for sugar mill machine. It is with a 110KW motor and the ratio is 80. The biggest torques could be up to 202000N.M. 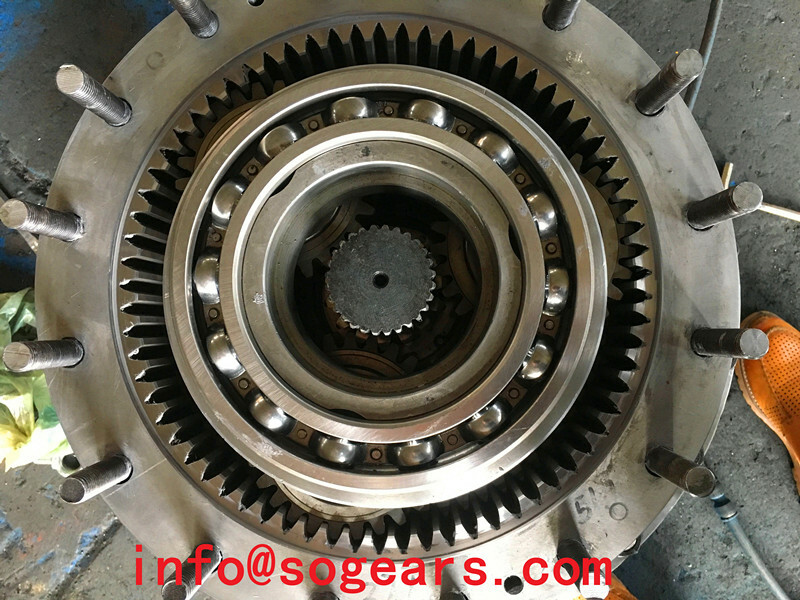 Since the internal gear lubrication of the planetary gearbox is driven by the high speed circular motion of the internal gear inside, the lubricating oil at the bottom of the gearbox is used to lubricate the gears. 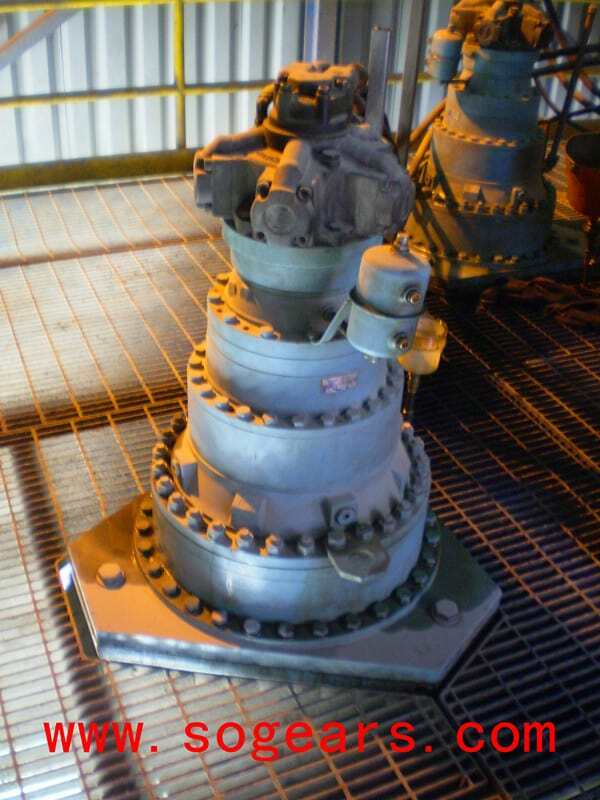 When the gear is running, the bottom lubricating oil is splashed by the gears, and the lubricating oil at the bottom of the reducer The position will decrease accordingly. 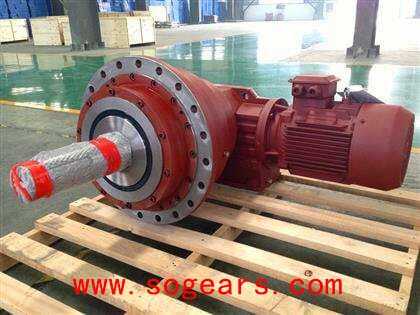 If the large-flow oil pump is selected, the suction of the oil pump will work when the gearbox is running at high speed, which is very harmful to the lubricating oil pump. Therefore, when the lubricating oil pump is selected, the oil delivery amount is smaller than the actual flow rate. 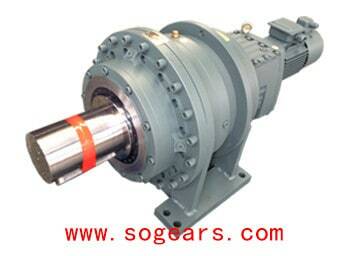 The reduction ratio of the single-stage planetary gearbox transmission mechanism is only about 3:1. And the two stages are stacked in series, the volume is doubled, and the reduction ratio is only about 9:1. 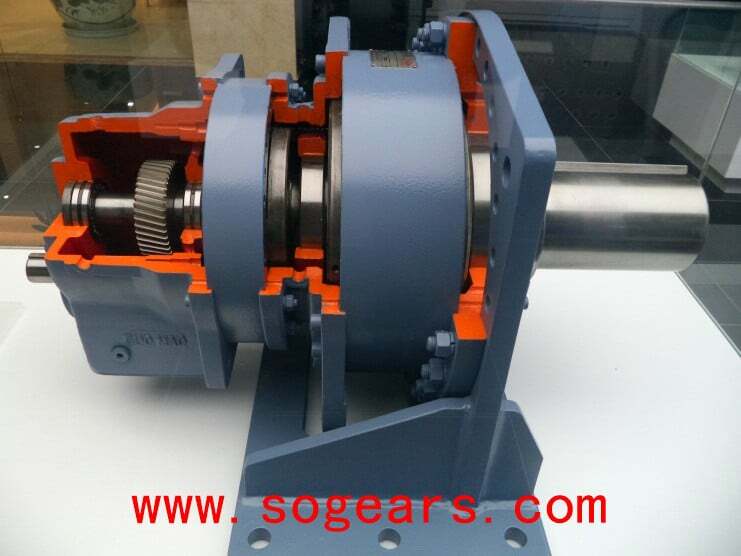 Therefore, if it is necessary to increase the transmission ratio, the conventional planetary gearbox transmission method will inevitably lead to a larger volume of the transmission mechanism, and is not suitable for occasions where there is a small space requirement for the arrangement of the transmission mechanism. This one is for the cooler and lubricating system. One is lubricating inside with the low density oil.The internal circulation is the splash lubrication. The splash lubrication is the automatic lubrication of the lubricating oil from the oil zone to the friction pair and the bearing by the rotation of the gear. 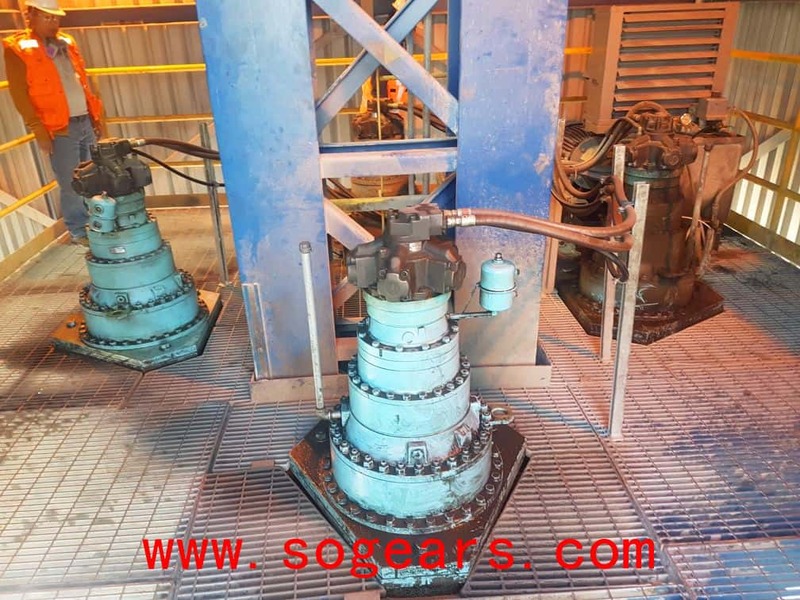 The splash lubrication is mainly applied to the case where the circumferential speed of the gear not higher than 12-14 meters per second. The other one is lubricating outside. When the linear speed of the gear is larger than 12-14 meters per second, the internal lubricating will increase the oil temperature, and some larger gearboxes are not ideal when using internal circulation lubrication. In this case, the external circulation is required. The external lubricating circulation is an oil pump. Injecting oil to the gears and bearings, not only for lubrication, but also for cooling. 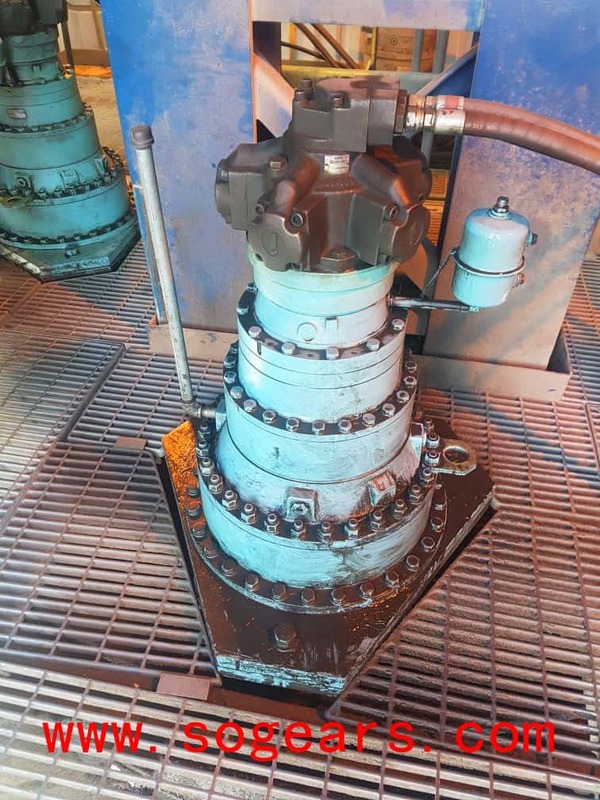 For the unimportant external circulation of the gearbox, only the oil in the gearbox is pumped out through the oil pump and sent to the various switching points, and then the lubricating oil flows in. In the tank, circulating the important reducer in turn, it is necessary to add a petrol station externally. At this time, the lubricating oil is not directly sent to the lubrication point, but enters the oil station, and the oil station processes the lubricating oil (filtering, cooling, etc.) After that, the lubricating oil is sent to each lubrication point, and the cleaned lubricating oil plays an important role in improving the reliability of the gearbox. 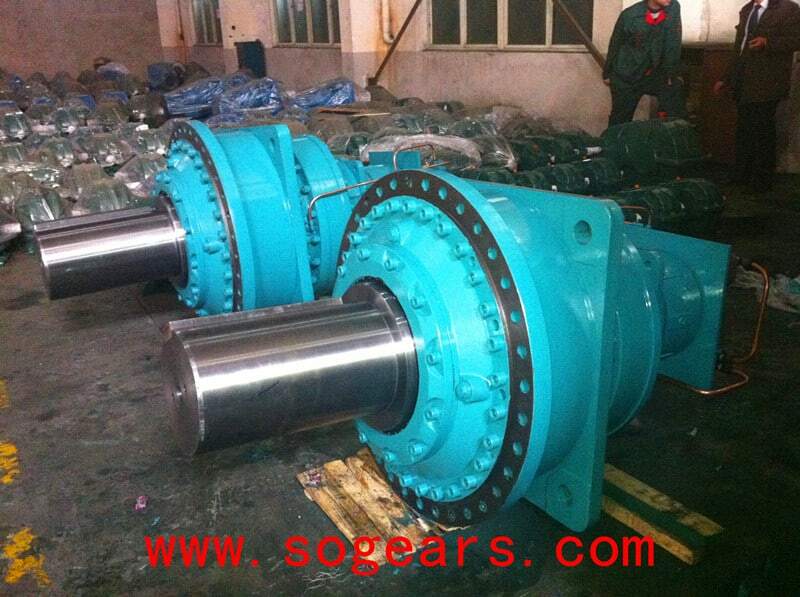 This is a long shaft planetary gearbox which is specially customized to a Poland customer. it is staggered by helical gears inside and this high-end planetary gearbox "sound whispers". 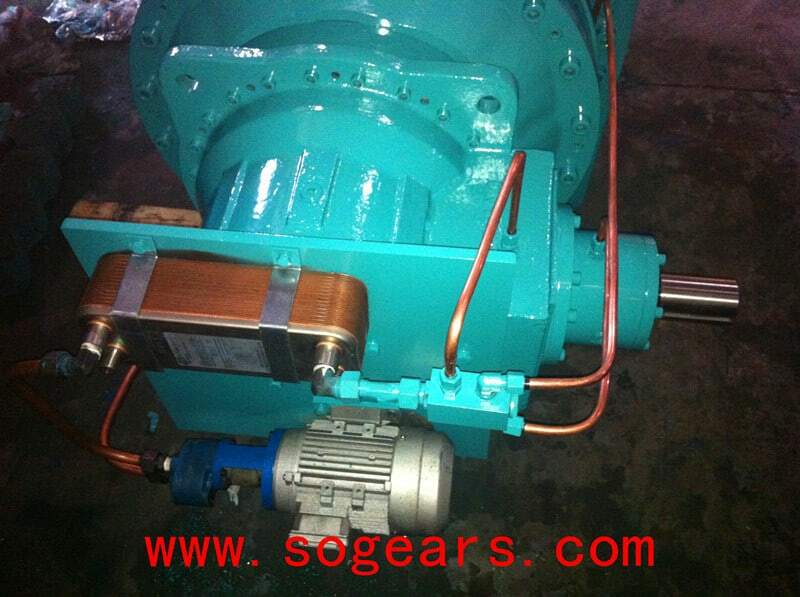 The operating noise is reduced by 6 dB(A) compared to the spur gearbox and our helical other geared gearbox. You know that the value created by 64 dB is much higher than 70 dB. In addition, it is surprising that you will be no longer feel the vibration and smooth operation. The high-class life expectancy with our independently developed seals which is for high-end planetary gearboxes. The raw materials are optimized and the geometry is also optimized. Planetary Gearboxes ready to export to Chile. This planetary gearbox was made for a Chile customer and they used to replace Brevini gearbox. You can see the old Brevini gearbox in the following photos. Our gearboxes are perfected to replace their ones. For our planetary gearboxes, some of the common features are: high quality steel materials, which are usually heat treated for the surface of the gears. After precision machining, it can meet some requirements of the positioning bearing and the parallelism of the shaft, and also guarantee some characteristics of the product quality. The torques for this one is as more as 110000N.M and the application is for powering in mining. This is the old Brevini planetary gearbox that the Chile end user used. Our cost is much smaller than Brevini's. and the most import this is that our delivery time is also much shorter that Brevini's. That's the reason why they chose us in the end. This order was delivered in May and the second order for the same quantity come from June. and now, the gearboxes for the second batch has been in the ship to Chile. We have won a good feedback from the customers and they said they would give us the third order which will be about in Oct. 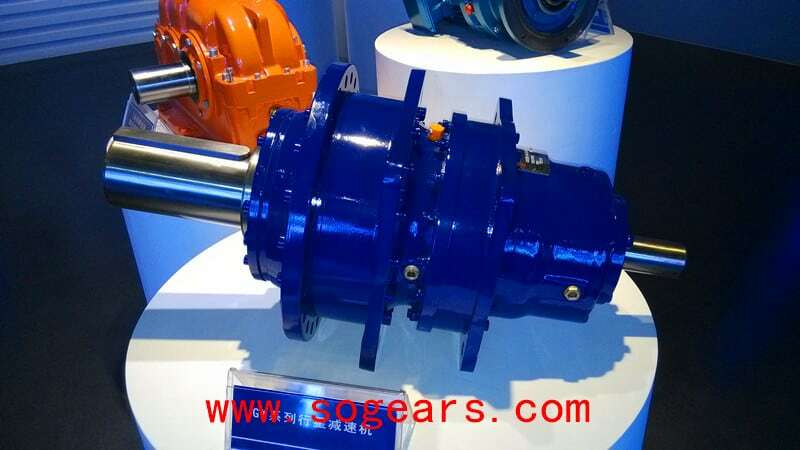 If you are from Chile and want to see these gearboxes, I can contact our customers to let you see. We have a more efficient lubricating pump on the gearbox. May be it is too old, and I think Brevini will also change this pump if they have this order. This gearbox is connected from hydraulic motor withe model number IAM500. The connection part between the motor and our gearbox was seamless connection. Of course, we also can supply this kind of hydraulic motors. But for this customer, they didn't because the old hydraulic motor is still in good condition. 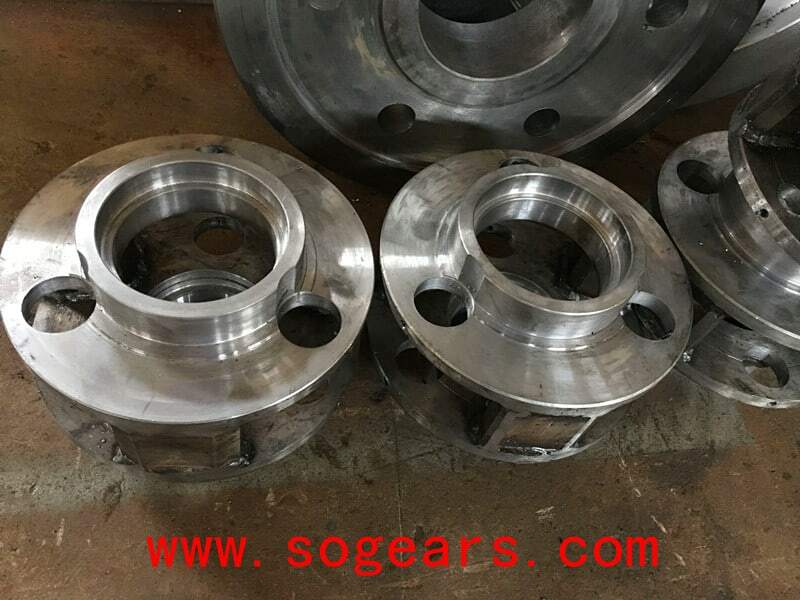 Planetary Gearbox Spare parts from the head. This the part of the gearbox in the input side. The steel used for strong torque. the transmission noise is much lower from this part because this is the fist connection from the motor. surface hardening, the most commonly materials are steel with a mass fraction of carbon of about 0.35% to 0.5%, and the hardness of the tooth surface can reach 45~55HRC. Carburizing and quenching,The most commonly alloy steel is with a mass fraction of 0.2%~0.3% of carbon before carburizing which is often in the range of 58~62HRC. The use of nitriding ensures that the gear teeth achieve high hardness on surface and wear resistance under the conditions of minimum deformation, and the final finishing can be omitted after heat treatment, thereby improving the bearing capacity. This has special significance for internal gears that are not easy to grind. If you want a planetary gearbox to get best used, you need to have a very comprehensive understanding of the equipment before using it. Some people use planetary gear reducers but they don't handle these aspects of work, so they can't get the best experience for all the work. As long as we can handle these aspects in a very comprehensive way, it will certainly makes the whole work more smoothly. 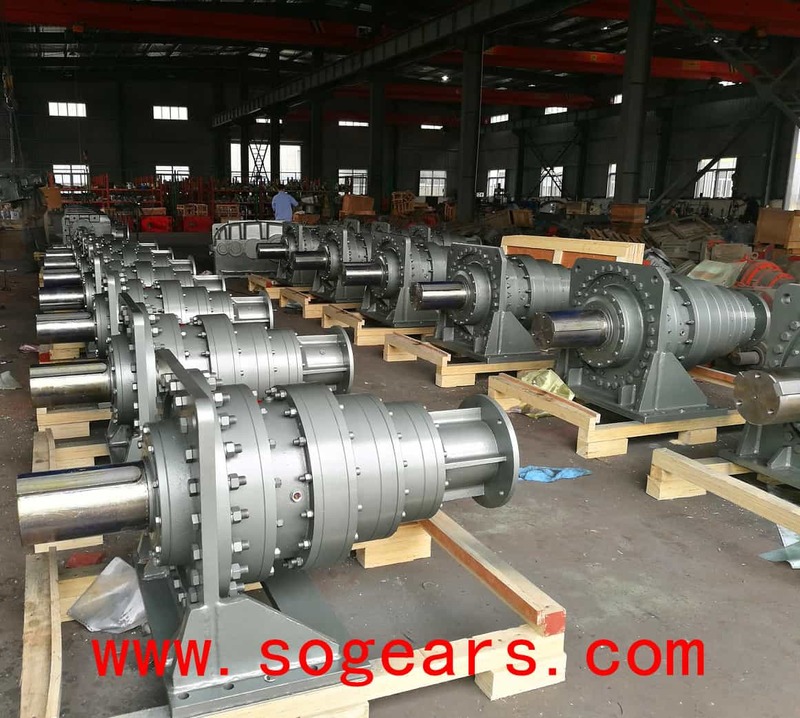 Therefore, it is very important to do this work when using a planetary gear reducer, which is also a prerequisite for ensuring the best help for the entire work. 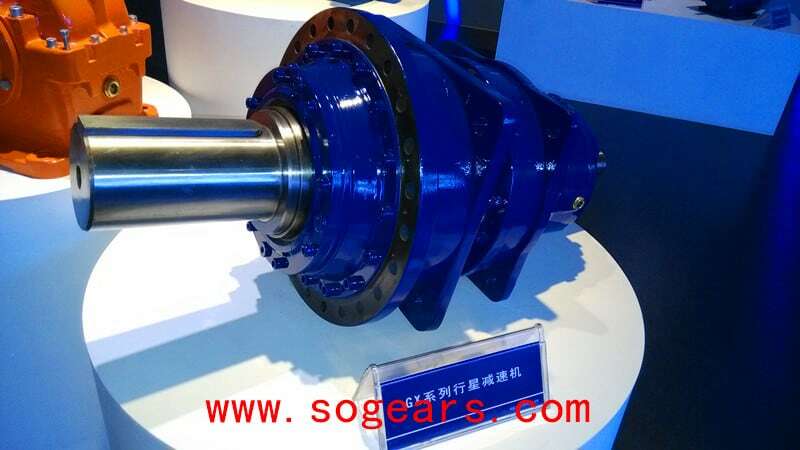 At the same time, the traditional multi-stage planetary gear transmission mechanism has a large number of parts due to the grading transmission, and the production and processing costs are also large. And because there are multiple active connections, the accumulated mounting clearance can affect the performance of the transmission. In the fuselage with fixed internal gears, there is a rotatable rack. On the planetary rack, there are several two-stage planetary gears radiating symmetrically with the center of the planetary gear. The first-stage and inner side of the two-stage planetary gears Engaged with the sun gear at the center of the casing, the outer side meshes with the internal gear fixed to the fuselage, and the other stage of the double-stage planetary gear is whistle with the output shaft with the internal gear, so that the sun gear and the double The first stage of the planetary gear and the internal gear on the fuselage form a set of transmission relations; while the other stage of the double stage wheel and the internal gear of the output shaft form another set of transmission relationship, when the sun gear makes the input torque applied, the two-stage the planetary gear is driven to rotate as the whole, because the internal gear meshed with it is fixed, so only the stepped gear can revolve around the center of the internal gear, due to the two of the stepped gears in rotation The stages have different numbers of teeth or modules, so the difference in speed ratio is generated in the above two sets of transmission relationships, and a difference is generated between the fixed internal teeth and the movable internal teeth that are respectively engaged with the two stages of the stepped gears, and Result with internal teeth Movement of the output shaft is rotated. 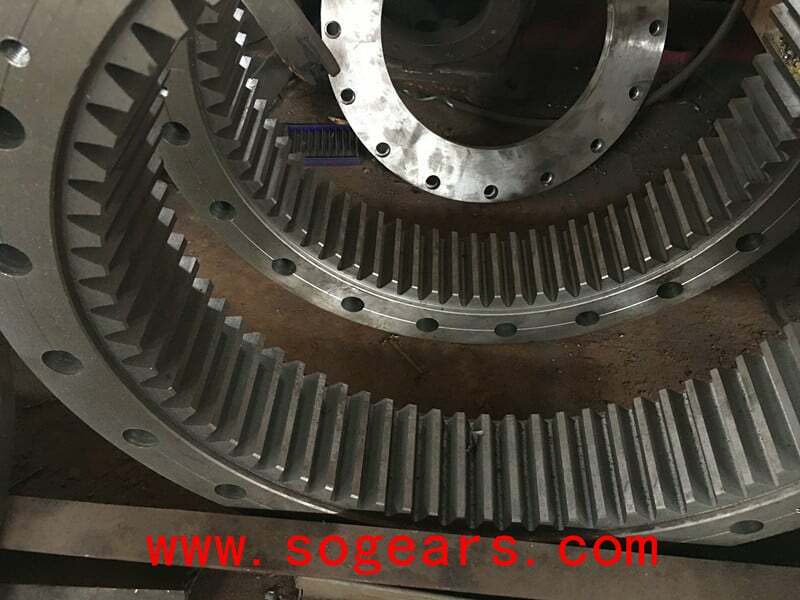 By adjusting the number of teeth and the modulus of the gears meshed with each of the above, the transmission ratio between the sun gear and the internal gear output shaft can be effectively controlled. 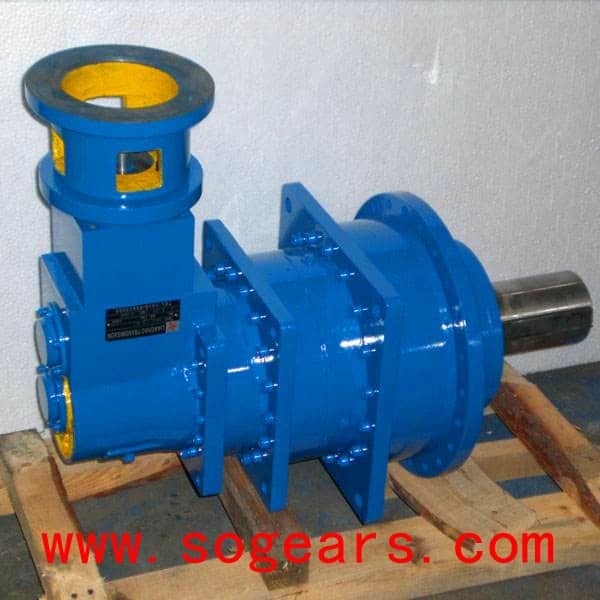 The planetary gear transmission mechanism is widely used in industry. In order to achieve a large transmission ratio, a multi-stage transmission method is generally adopted. Taking a conventional two-stage planetary gear reduction mechanism as an example, the first-stage transmission mechanism includes the first stage. 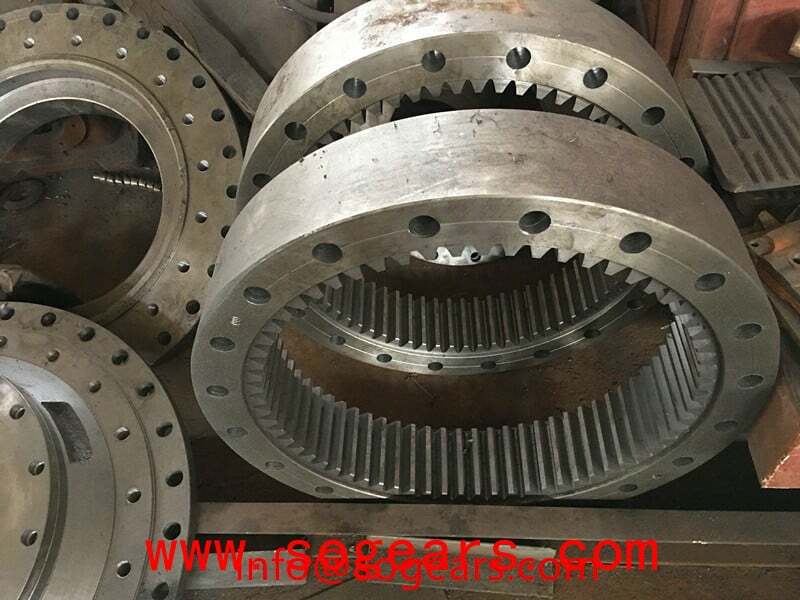 Inner steel geared ring, first stage sun gear and first stage planet body, and two to four first stage planetary gears mounted on the first stage planet body, planetary gears and first stage inner ring gear and first stage sun gear Both are meshed. 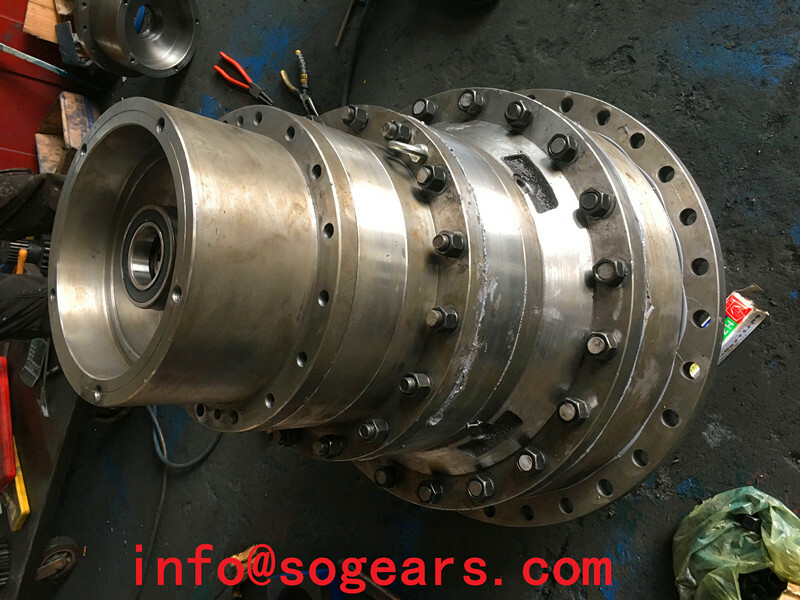 Usually, the first stage inner ring gear is a fixing member and is fixed in the housing of the speed reducer. The first stage sun gear is connected with the servo motor shaft, is an active part, and inputs high speed torque. The first stage planetary gear is driven by the first stage sun gear to rotate and revolve along the first inner ring gear, thereby driving the first The planetary carrier rotates, and the speed is reduced, the torque is increased, and then output to the second-stage transmission mechanism. The first stage carrier simultaneously serves as the input shaft of the second stage transmission, ie the second stage sun gear. Using the same transmission method, the torque is increased again and the speed is reduced. The second stage carrier is output to the external actuator.